Sporting her bedazzled cane — black with sparkly rhinestones — Benham shows she is not ashamed of her connective tissue disorder. But she is quick to point out that not all disabilities are treated equally. Living with illness and disability can be especially challenging when it is “invisible.” And because illnesses are not always perceived by onlookers, they are often undermined and misunderstood. Benham, a doctoral student and graduate teaching fellow at Pitt, and an organizer at the Pittsburgh Center for Autistic Advocacy, has multiple disabilities — autism, panic disorder and a connective tissue disorder. Benham said she sometimes experiences a disconnect with others in daily interactions because of her disabilities. “As an autistic person, I don’t tend to make eye contact in the ways people expect, so sometimes people think I’m being disrespectful or not listening, when I am actually paying attention,” Benham said. Brett Cooksey — a Pitt graduate student in the master of social work program — said he sometimes faces a similar disconnect even with people who know he has autism. “They do not see me at home spinning in circles or repeating phrases over and over, and I feel like because they do not see me as visibly disabled they will just assume that I am feeling perfectly fine on the inside,” Cooksey said. Cooksey also faces another kind of misunderstanding with his type 1 diabetes, which is not a preventable condition and is commonly diagnosed in childhood. “When people find out I have type 1 diabetes, one of the most negative reactions I get is ‘oh, you must have ate too much sugar when you were younger,’” Cooksey said, referring to a common misconception of the disease. But misunderstandings can cause more than temporary frustration — they can have long-lasting consequences on those affected. Isaiah Noreiga — a Point Park University doctoral psychology student studying clinical community psychology and a steering committee member of PCAA — also has first-hand experience with “invisible” illnesses. Noriega — who has bipolar disorder and depression — said growing up, he was perceived as a problem child and said this perception had a significant impact on his relationship to education. Benham said people with different needs are not extra or “special,” and everyone should be supported in school. “Everyone has support needs when they learn, and the University should be invested in supporting all of its students,” Benham said. For those with disabilities, Pitt’s Disability Resources and Services has numerous accommodations available to students — including extended time on exams, text-to-speech software, a Disability Shuttle and single rooms in residence halls. Benham said her department at Pitt is supportive and understanding, but Cooksey said many other people are not. “I have encountered people who have been cruel to me even after I have tried to explain both of my conditions to them,” Cooksey said. Fostering an inclusive environment, Cooksey said, helps people with “invisible” disabilities feel more comfortable and be better understood. 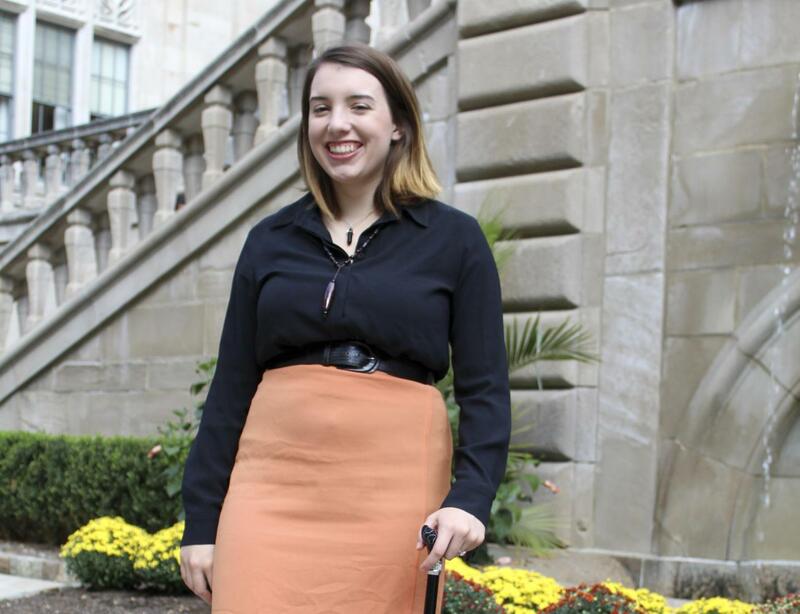 “I think it is unreasonable to expect someone with a disability — invisible or not — to always be comfortable or willing to educate others when they are often already struggling as is,” Cooksey said. When constantly faced with misunderstanding, Benham said it is important to remember self-worth. “How I negotiate that [misunderstanding] in a world that’s not always friendly to me is to remember that the reactions of the people to me do not define my value — that my value is in that I’m human, just like everybody else,” Benham said.